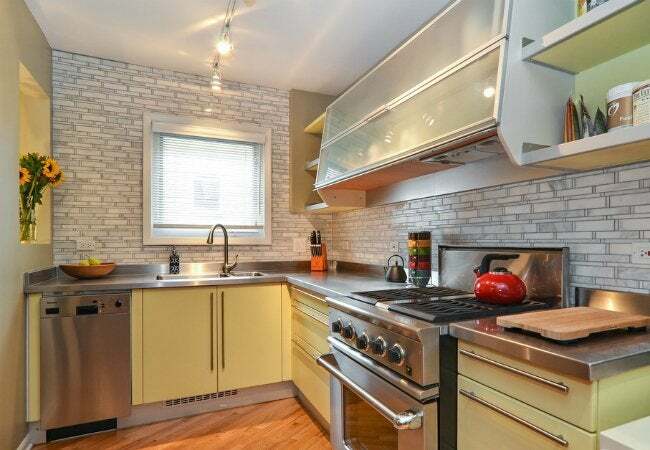 If you’re a serious cook, you should seriously consider all the possibilities stainless steel countertops have to offer in a hardworking kitchen. Fancy yourself an at-home chef with serious skills? Then you may be interested in upgrading your cooking space to one that embodies your enthusiasm. The quickest way to bring a professional vibe to your home’s meal prep zone is by incorporating a restaurant-kitchen hallmark: stainless steel countertops. Once primarily found in restaurants and commercial kitchens, this material has gained recent popularity with residential homeowners who have similar (albeit on a smaller-scale) needs: a durable, stain-resistant, and heat-tolerant worktop—with a contemporary flair to boot. The sleek, modern appearance of stainless steel complements both traditional and modern kitchens. 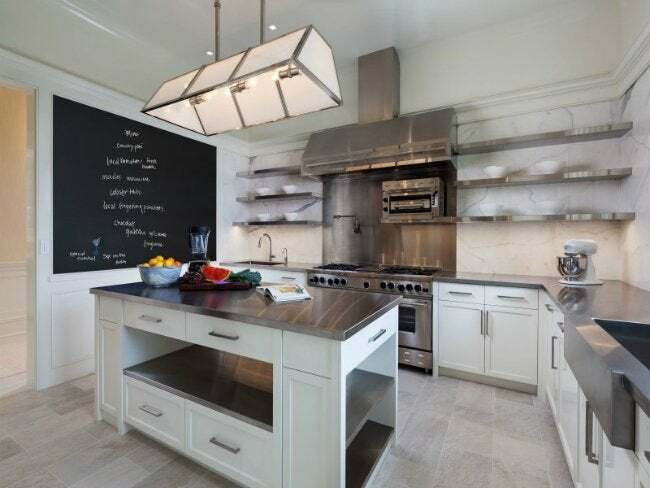 While some worry that a metal worktop may look too austere, certain areas of customization can soften the appearance. • Edge profiles. The square edge is the most popular style, with other options including a bullnose, beveled, or unwrapped edge. • Finish options. As you’d find when shopping for faucet fixtures, stainless steel countertops come in a variety of alternative finishes: satin, mirror polish, brushed metal, and antique matte. If fingerprints or smudges are a concern, choose a brushed finish for its smooth, soft look which more easily hides evidence of sticky fingers. • Square feet. Avoid imitating a restaurant kitchen too closely by adjusting the amount you choose to install. 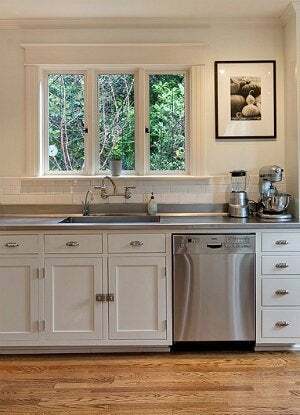 Consider starting small, mixing it in as a stand-alone island in a kitchen designed with butcherblock or granite countertops—this reflective surface blends in with nearly any aesthetic, much as a stainless steel sink can pick up the color temperature of its surroundings. • These counters cannot burn or rust. Unlike other countertop materials such as wood and stone, food grade stainless steel resists both heat and rust, thanks to a combination of chromium and nickel. That means you can place a hot pot on the surface and, when you lift it later, you’ll find zero scorches. And while you may notice water will leave a temporary ring if left to dry, the metal’s special composition prevents permanent damage. • Additionally, as the name would suggest, they are impervious to stains. Spill a glass of red wine? Wipe it up without worrying about a lingering color! Oils, acids, drinks, and more that might mark up wooden counters won’t set on stainless steel—ideal for the room in the house house that hosts most of the food messes. • To top it off, the metal is 100 percent recyclable. Selecting this environmentally friendly ingredient for your kitchen construction keeps your carbon footprint minimal. While there’s no denying the positive qualities of stainless steel, you may want to take a seat at the kitchen table for the bad news: Contact with your metal cookware and cutlery can get dicey. First, there’s the noise—the clashing and clanging—that happens when cooking equipment makes contact with the metal surface. But an even larger reason to get in the habit of setting down those pots and pans gently would be to decrease the likelihood of scratches on the new surface. 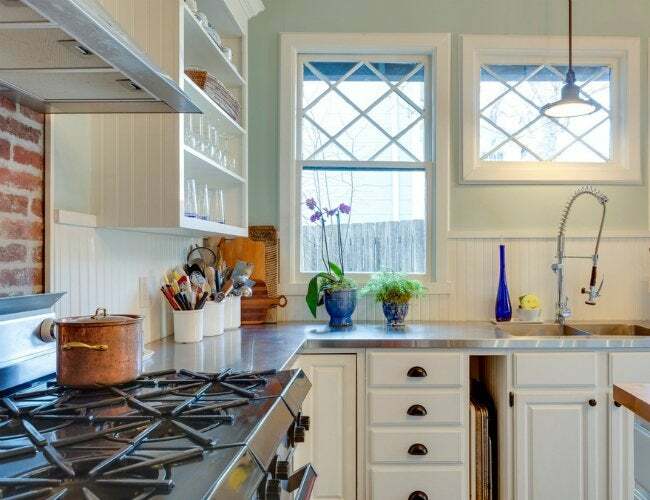 Lower-gauge stainless steel has a propensity to dent and scratch, so if you’re looking to turn your kitchen into a restaurant-worthy cookspace, it’s best to purchase the strongest, thickest material you can afford. Even then, stainless steel countertops will “age” over time as objects slide, rub, and drop on the surface. These high-performing stainless steel countertops go for between $50 and $150 a square foot—right in the same ballpark as marble. Price varies depending on the gauge, which ranges from 14 to 20. Rule of thumb: The lower the gauge, the thicker the steel and the more expensive the product. When planning your installation, you’ll want to invest in the highest gauge within budget, as a thicker countertop means less chance for dents. While a nylon sponge and warm, sudsy water are often all it takes to clean this stain-resistant worktop, messy meal prep might require a light scrub: Sprinkle baking soda across the surface, wipe vinegar over top in the direction of the grain, rinse, and dry thoroughly. Then, restore maximum shine by working just a few drops of mineral or olive oil across the surface and buffing it out with a dry a cloth. It’s that easy! Just remember to avoid harsh abrasives—like the scrubbing side of a sponge—which could do more harm than good and leave scratches behind. Unfortunately, deep scratches and dents are near impossible to remove without professional restoration. Surface scratches, however, can be carefully “rubbed out” using a mild abrasive pad. Working a 180-grit pad in the same direction as the existing grain will help blend the existing scratch mark by removing micro amounts of material. While not all scratches will completely disappear, this scouring action will, at the very least, dull their appearance. Whatever remains can be considered a badge of honor in your hardworking kitchen.